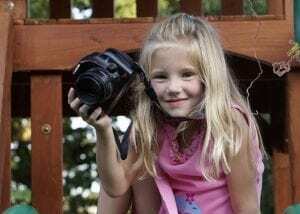 Ryleigh Harvey, age 7, is a perfectly healthy, active little girl. The first grader loves art, dance, and music class, enjoys school, and likes to watch Cutthroat Kitchen and help her parents cook. According to her father Bo Harvey, Ryleigh has yet to find an activity she doesn’t enjoy. In fact, any evidence that Ryleigh ever spent time in the hospital is all but gone. Ryleigh and her twin sister Huntleigh surprised their parents by arriving 16 weeks early. Bo and Jenny Harvey were spending time with family just before Christmas when they realized the girls weren’t going to wait a full nine months to make their grand entrance into the world. “We weren’t prepared. We had no plans,” Bo said. Obstetrician Belinda Kohl-Thomas, MD, worked to prevent the twins from being born too soon, but Huntleigh arrived four days later on December 27, 2008. Ryleigh was born about a week later on January 3, 2009. Both girls had severe health issues related to their premature birth. Unfortunately, Huntleigh’s underdeveloped lungs collapsed and she passed away just 10 hours after her birth. In spite of their loss, the Harveys had to be there for Ryleigh, who went on to spend the first 88 days of her life in the NICU. Ryleigh was on a ventilator after her birth, and underwent surgery to repair a heart condition common to premature babies known as Patent Ductus Arteriosus (PDA). In the womb, babies have an opening in the heart which allows blood to bypass the lungs, since oxygen is provided by the mother through the placenta. Normally, this opening closes within a few days after birth as babies begin to breathe on their own. However, in babies with PDA, this opening does not close and causes abnormal blood flow within the heart, mixing oxygen-rich blood with oxygen-poor blood. Even after her infection healed, Ryleigh wasn’t done overcoming hurdles. After a month, her doctors were worried her lungs hadn’t developed enough to take her off the ventilator. A steroid treatment could help her lungs develop, but studies had shown that the treatments could potentially have a negative impact on the patient’s IQ later in life. Ryleigh responded to the steroid treatment and was able to come off the ventilator within a week. Bo says they have seen no side effects related to her intelligence. To honor Ryleigh and the doctors and nurses who supported them, the family set up the Harvey Family NICU Fund to provide a resource center in the parents’ lounge in the NICU at Scott & White Memorial Hospital. The resource center houses lockers for parents to store their personal belongings that can’t be brought into the NICU area, as well as a computer where parents can catch up on work or find out more about their child’s condition. “We wanted parents to have more opportunities to get the information they need, just like the NICU staff did for us,” Bo said.